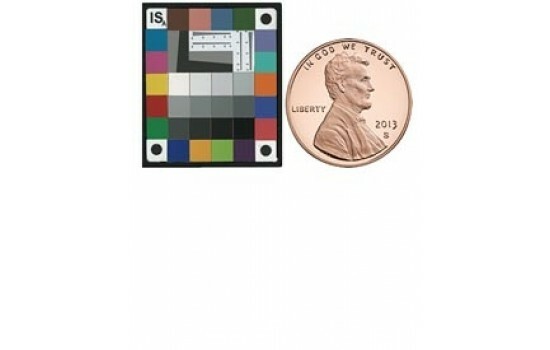 All target patches are made in cooperation with Munsell Color Services from the same pigmented color paints as the GretagMacbeth™ ColorChecker®. At center are 12 spectrally neutral gray patches for assessing correct exposure and white balance. (These are NOT ink-jet, photographic, or electro-photographic generated colorants). The slanted edges can be used to reliably measure SFR or MTF out to 3000 dot-per-inch or 60 cy/mm with the appropriate software. Five line visual hyperbolic wedges are also included to aid in visual assessment of limiting resolution to 850 dpi. The patches are mounted on aircraft grade anodized aluminum and are set below the top surface to help protect from damage. 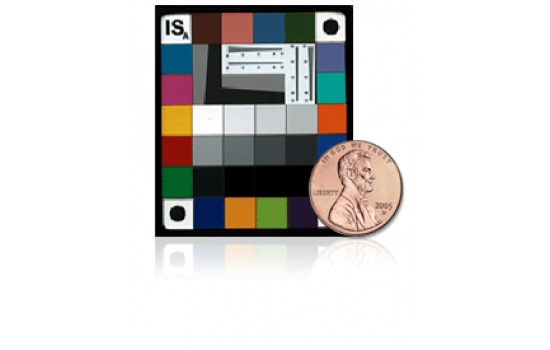 Micro Target: Patch sizes are 1/4” x 1/4”. The overall size is 1-7/8” high x 1-5/8” wide x 0.060” thick and are available with either gloss or matte center gray patches. 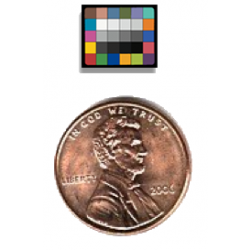 Nano Target: Patch sizes are 1/8” x 1/8”. The overall size is 1.0” high x 7/8” wide x 0.060” thick and are available with either gloss or matte center gray patches. All colored patches on the perimeter are matte finish. Because these targets are hand cut and assembled, very minor patch mis-alignments may occur. They do not affect the target’s utility.